Real's Javier Morales fashions his own departure. In the 2009 MLS cup, Real Salt Lake midfielder Javier Morales was brutally tackled and barreled to the ground by then LA Galaxy's David Beckham. This was the final that then-coach Jason Kreis and his team of hard-fighting misfits cobbled together from the U.S., South America and Europe had fought so hard to reach and after just 20 minutes the typically stoic Argentine was tearfully limping off the field to watch the rest of the game from the sideline. 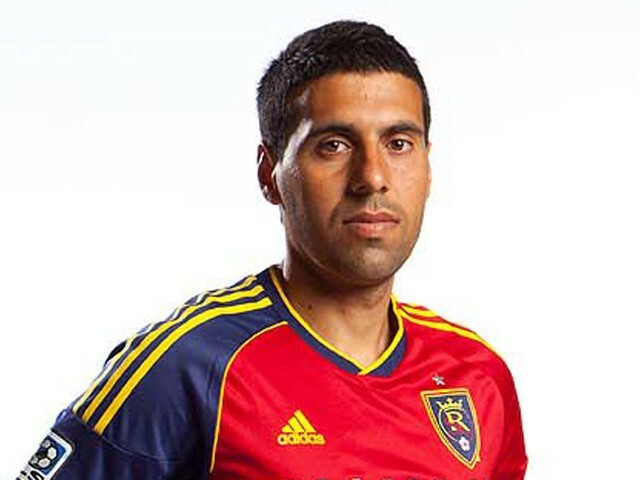 Fast-forward seven years and Morales is gone, Real Salt Lake having decided not to pick up his option at the end of the 2016 season. He walked out of his annual exit interview with front office staff, and refused to talk to the press. A week later, he organized a downtown Salt Lake City press conference, the afternoon after Real announced that morning it had signed coach Jeff Cassar to one more season. While Morales questioned the rationale for his departure—he alleged that the team had deliberately benched him for the last game so he would not make his required 24 appearances, something Real denied to local media—his belief he had several more years to give as a player fell on deaf ears. I first saw Morales play in Argentina, shortly after Real had signed him, along with several other Argentine players back in March 2008. Kreis' journey to Argentina was chronicled in Reality Check. Over the subsequent years, while other Argentine and Latino players came and went, Morales not only stayed but blossomed. He had his second child in Utah and, along with goal keeper Nick Rimando and midfielder Kyle Beckerman "were the three fundamental pillars of the great sporting history of Real Salt Lake as one of the most successful franchises in the MLS league," wrote longtime sports reporter and radio broadcaster Carlos Artilles, in response to emailed questions. Artilles, who has covered Real from its conception, argues that Kreis developed his style of ball control and attack through the deeply gifted Morales and Beckerman. In 2011, after reaching the finals of CONCACAF, losing to Monterrey at home 0-1, Morales, one of the most fouled players in the MLS, suffered a horrific break just above the ankle that saw the screaming player trying to hold up his broken foot. His number 11 was the subject of chanting and tears when he returned to the field, and in recent years he's continued to score remarkable goals from free kicks and improvised moves, such as the glorious 2013 over-the-head bicycle kick into the right hand corner of Portland's goal, that saw Real win 3-1. "His fighting spirit and professional commitment has made 'Javi' not only a symbol of success on the field," writes Artilles, "but also off the field, in the locker room and as an image and identity of the club." Morales was akin to a father figure to players coming from South America and trying to find their footing in Utah's foreign culture. Artilles credits Morales with a fundamental role in elevating soccer's popularity and growth in Utah. Like so many others in Real's stands, it was Morales who gave me the most excitement in terms of how he would conjure up attacks on the goal with precision and almost laconic wit as he exposed the weaknesses of the opposing defense. In a 2009 story, called Real Passion, I wrote that "Morales displays a maturity of ball control and insight into the game that can make him glorious to watch. Indeed, if (then-striker, now talent scout) Andy Williams is the emotional heart of the team, then Morales is its elegance. He is the architect of many of its buildups to goals, and has an ability to read the game when distributing the ball that colleagues such as Robbie Findley admire. “I look for where we can enter,” Morales says, “where we can hurt [the opposing team] and those on our side who are doing well.”"
Morales' departure from Real, whatever the politics, financial and other realities that might be behind it, displays an awkwardness and ingratitude that is all the more surprising given all that the Argentine gave the club. However, Artilles says that the club reached out to Morales' agent the day of his press conference to inform him that "the door is open to negotiate a new contract." Artilles sums up the anguish many felt at the way Real handled Morales' dismissal: "The departure of Javier Morales, "el maestro," (the teacher), not only represents the sad epilogue to a brilliant era, of a style of soccer, at Real Salt Lake, if not also a loss of respect, of elegance, of grace at a club that is still young, and which it has to gain back. Javi is a reference point for the club in Salt Lake, he's already an institution in the history of the franchise and of soccer in Utah, and he deserved to be treated differently when he left." In a postscript, longtime defender Jamison Olave, who left Real, then returned several years ago, quietly announced his departure too.